“True belonging doesn’t require us to change who we are. 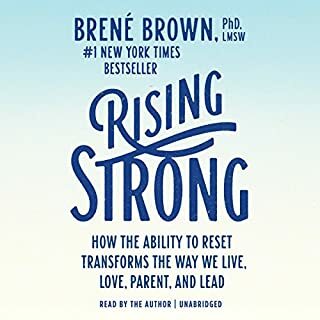 It requires us to be who we are.” Social scientist Brené Brown, PhD, LMSW, has sparked a global conversation about the experiences that bring meaning to our lives - experiences of courage, vulnerability, love, belonging, shame, and empathy. In Braving the Wilderness, Brown redefines what it means to truly belong in an age of increased polarization. With her trademark mix of research, storytelling, and honesty, Brown will again change the cultural conversation while mapping a clear path to true belonging. This book is a must read for all that care about the world, their country, community and their family. No matter what nationality. Brown takes on the big, core, messy issues of our time, unpacks them with accessible language and reasoning and offers us agency where there feels like there is little. She lovingly challenges us to move towards transitioning into the kind of community we really want to be. The kind of community that she proposes we're wired to be. A caring and connected community. If you're a political junkie, read this book. If you're an activist, read this book. If you're an extremist, read this book. If you're trying to be detached from it all, read this book. This book is the how-to for meeting Rumi in that field between wrongdoing and rightdoing. A book I wish everyone could hear. Especially those with a wild heart! Great book. The first chapter rang true. Chapter two continued along the same lines - resonating with my sense of independent character. The rest did not impress me. Nothing untrue, just repetitive. 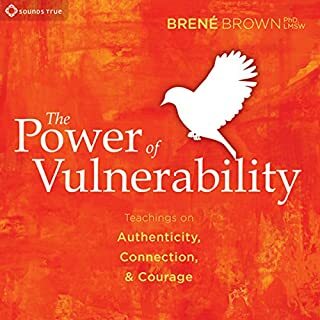 I would suggest the power of a vulnerability for a first time Brene Brown listener and build up to this one. The audio book is preformed by the author in a studio, alone, which contributes to a somber tone for this book. If you stick with it it, there are insightful thoughts at the end of the chapters. For example, in an academic tone Dr. Brene Brown voices her disagreement a poetic Dr. Toni Morrison quote on belonging. It starts off sounding like a lecture on why she believes Dr. Morrison is wrong. Eventually she does get to a deeper understanding of the context of Morrison’s quote, but it would of been nice if the audio came from Toni Morrison whom she had frequent conversations with or recounting this story to an audience with Oprah whom she mentions frequently. The collective Joy and humility are lost in this particular format. It’s my preference to hear her work about people with audience responding to her storytelling. Lovely and inspiring to be true to you. Loved it and constantly go back to it. Hearing the passion directly from Brene is amazing! 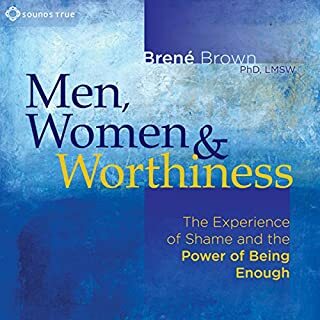 This is my first experience with Brene's work and it was moving, insightful and deeply personal. As someone who works closely with people everyday, I often have to gather all the courage I can muster to be authentic in a world that would rather I got in. I have lived in the wild all my life and while I think I do it well it is nice to know that I'm not doing it alone. Thank you Brene for your research and for giving a voice to all the wild hearted folks out there. I tried fitting in all through my public school years. Then I gave up, dyed my hair, donned combat boots, and started sporting a Mohawk. And I became wildly popular as a nonconformist. Still, I was miserable. I had no idea how to be me, whatever that entailed. 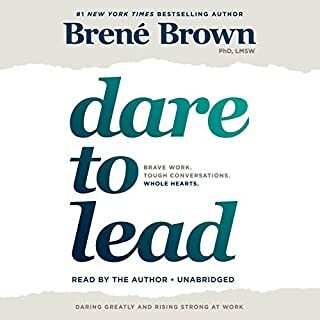 I love Brene Brown, have all her books, and each has inspired me. Still, inspirational and actionable are two different things. Finally! Braving the Wilderness has steps one can really, honestly, truly take to get to that fabled goal of Authenticity. 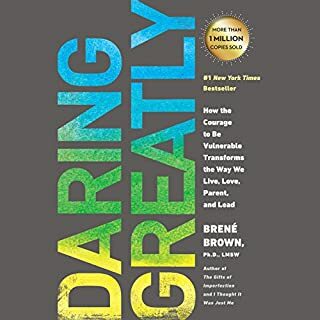 Her research brought her to the wonderful checklist, an acronym: BRAVING, where B is Boundaries, A is Accountability, I is Integrity, G is Generosity, and the other letters/elements are covered also in great detail. The challenges that arise with each of these elements are covered, everything, the whole nine yards. 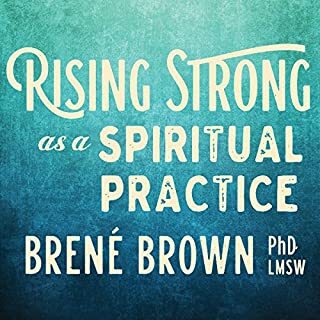 Also, and this I thought was brave of her, Brene discusses how exactly we got to be the volatile, fractured nation we are today; plus she highlights steps we can take to make our interactions with each other more humane, more transformative. And it's not by staying in our own camps either. I know: HARD. 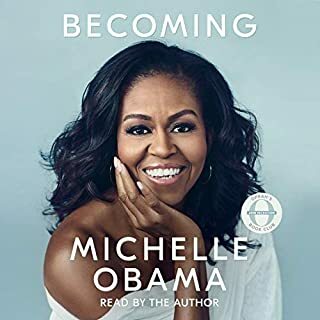 Her narration is warm, her examples, some her own on how NOT to do something, are enlightening, her hope is genuine and contagious. Okay, so no Mohawk here. But I am ready to take those fearsome, courageous, first few steps...! There's SO many points to touch on. Impossible to. Instead, I'll list a few favorite parts. Knowing this is different for everyone who reads. 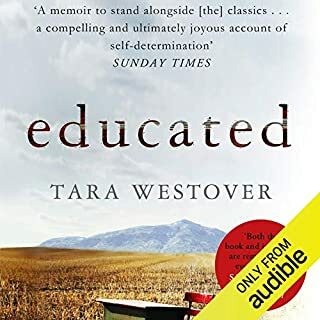 Maybe I just had no idea what I was getting, but I was surprised that this book is mainly about embracing relationship with those who think (fairly specifically politically) different than you. It wasn't a bad message, but I tend to often find common ground with those who express different views so this wasn't quite what I was looking for. 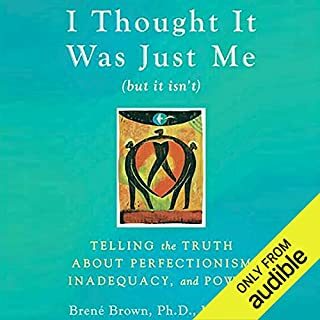 I love Brene Brown & what she stands for. What a great challenge as parents and role models to help kids know that they do belong & are loved. 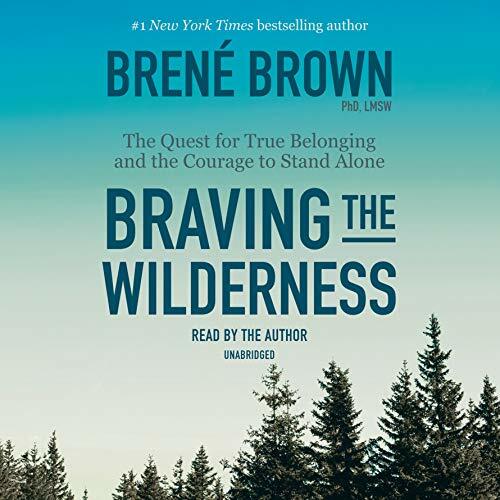 My favorite theme from this book is "stop searching for confirmation that you don't belong"
Would you consider the audio edition of Braving the Wilderness to be better than the print version? 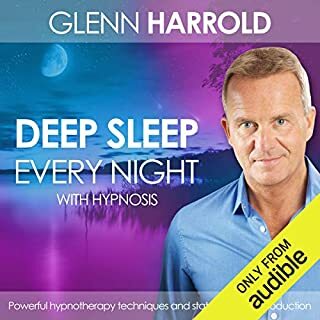 One of best of Dr. Brown's Audio Books. She shares a lot of her new research about knowing yourself and your needs when choosing to be a caring person. I enjoy listening to her she has a unique style of communicating. The quotes from Maya Angelou were very important to the spirit of this book. 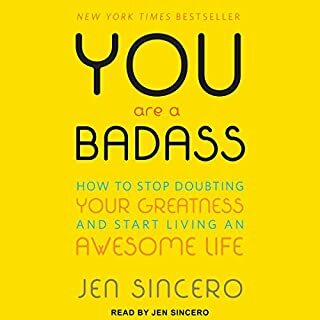 She introduced a variety of research studies and quoted from letters and books from successful people who overcame their fears. Most moving for me was her visit with the Sandy Hook parents. There ability to unite together in love was inspiring. 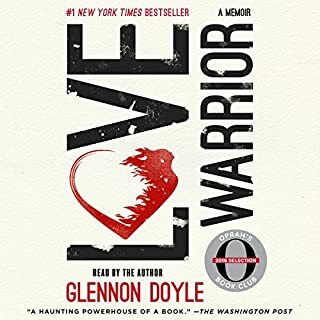 I recommend this book for those who find they are angry about their situation in life and do not understand why the feel like a victim of circumstances beyond their control. Her discussion of methods of not to seeing yourself as an outsider who doesn't fit in anywhere are the most valuable part of this book. I used my credits on this book on a whim. Perhaps it was written more for people looking for her opinions on these subjects. I found it to be a winding narrative without much grounding in research or peer reviewed work. It was mostly the author sharing her opinions on what she learned. Also, I think the book’s lessons are more suited for extroverts and learning to argue fairly. 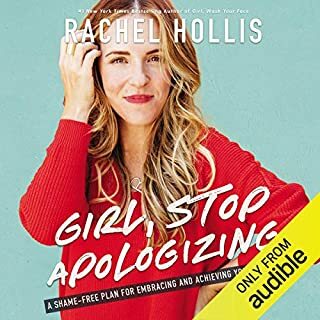 I’m glad the author learned how to slow down and think rationally for herself, but I’m not sure why that needs to be a book for the rest of us to read. 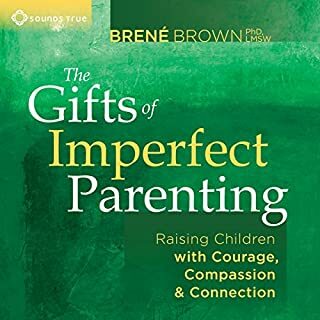 I have read all of Brene Browns books and listen whatever I could have find from her. 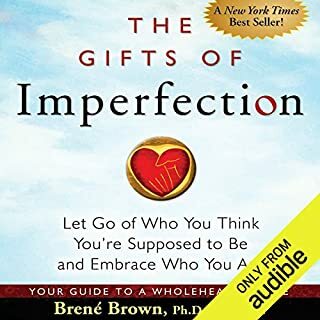 When I saw her latest title I was having joy and because she was narrating her own book decided to buy the audio version. The book is well narrated by her. However book itself is a disaster. She is an expert in vulnerability. 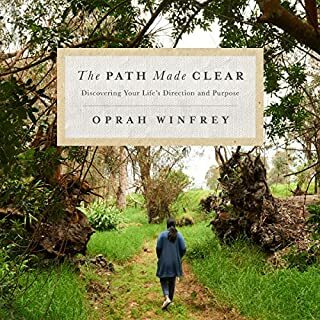 Her “research” based claims with proper references made her earlier books and audios a true five star self help books. Yet this one is what? She has a concept of wilderness. But she doesn’t go deep in with evidences and research based claims on what it is, methodologies to adapt it in your life or even she doesn’t have any focus. If you are familiar with maya angelou, by her book instead as this book is almost a replica of Maya’s ideologies. Deeply disappointed. Another point for non-US readers. This book is not for you. As a non-US reader I couldn’t relate to most of the book and its themes ie guns, community, etc. Putting on jeans instead of slacks is not brave. This is the first books that I have deleted without finishing. After investing a couple of hours, I had to finally surrender. It just brings you down with all of the whining about life events that are trivial compared to what others go through. Not making the pep squad? Being told to wear business attire to a business function? Being asked not to curse at a corporate function that was paying you to speak? Really?? These are the times you felt you needed to “brave the wilderness.” This is not bravery. 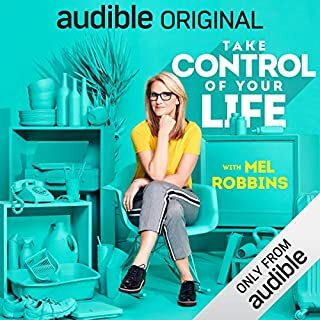 This is life and she seems to have it pretty easy compared to others dealing with tough issues, ie battling cancer, losing a spouse, being layed off from a career. 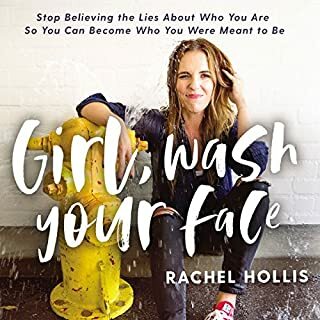 This book was definitely not for me but may be helpful to a teenage girl trying to find her path. Personal struggles and opinions of the author delivered with passion. Unfortunately the text falls short in delivering meaning, and often tends towards self pitty and sentimentalism. Research seems anecdotal at best and mostly dated, at least for the part of the world outside the USA. Lord have mercy this book was huge disappointment and lacks a thorough race, gender, and class analysis while making cloaked and sometimes overt assertions about race, class, and gender. Read this if you’d like another text chalk full of white feminist fragility and calls to empathize with actors of oppression. While there are some redemptive moments, over all the name dropping of influential Black folks while essentially unpacking an analysis on interpersonal living that requires “colorblind” and respectability politics was too much.